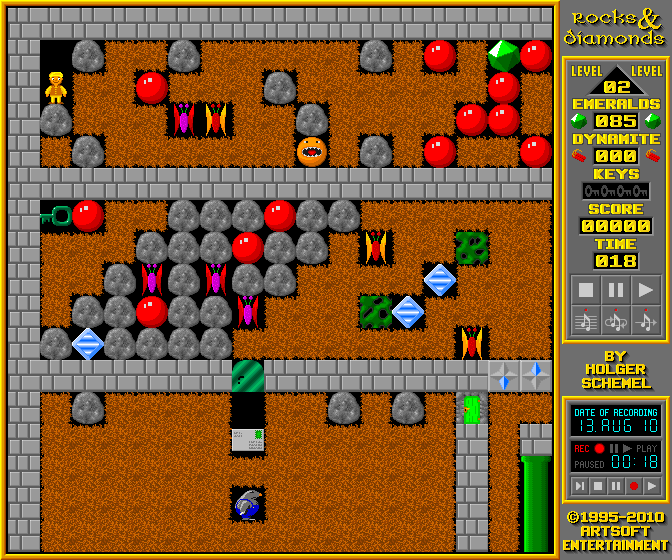 This game recreates the engines of Boulder Dash, Emerald Mine, Supaplex and Sokoban, and does so faithfully enough to be able to replay the original games. However, it doesn't stop there. The game evolved enough to be able to use elements from all 4 games at the same time, use of custom behaviour elements and all sort of trickery that can turn the game in something completely different. Thanks to this customizability, the game has spawned hundreds and hundreds of custom levels. Highlights include Snakebite, R'n'D jue special collection or the Zelda adventures. Also for the more purists, thousands of the original levels for the original Emerald Mine, Supaplex, Boulderdash and Sokoban are available, converting this game almost into an ultimate collection. Check https://www.artsoft.org/rocksndiamonds/levels.html for more levels and drop them to the appdata/rocksndiamonds/.rocksndiamonds/levels folder. notaz SDL didn't work properly here (though I HAD it working manually at one time on my card...), so I changed it back.